Nathan Fillion stories at Techdirt. 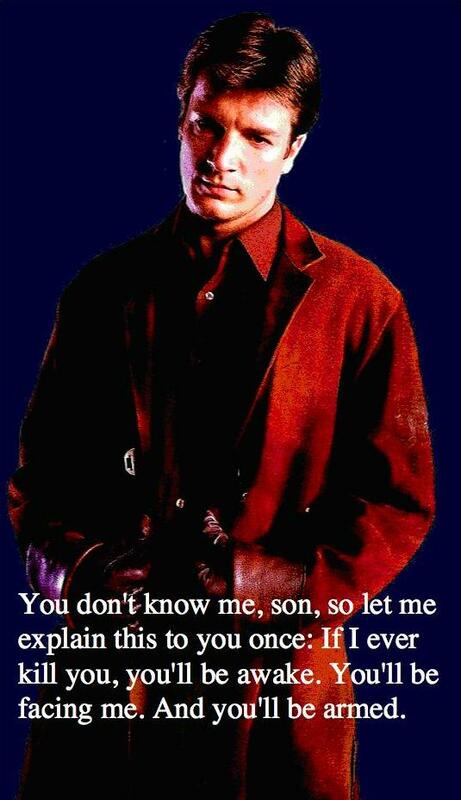 stories filed under: "nathan fillion"
"You don't know me, son, so let me explain this to you once: If I ever kill you, you'll be awake. You'll be facing me. And you'll be armed." The clueless police at the University of Wisconsin-Stout not only failed to actually comprehend what the quote means, but also didn't consider the context or the fact that it's a line from a popular show. Instead, they decided that it was against the law and removed it. In an email to Miller, UWS Police Chief Lisa Walter told Miller that "it is unacceptable to have postings such as this that refer to killing." Of course, it doesn't really refer to killing, and that's such a vague and ridiculous standard -- especially coming from law enforcement for a state school, whose decisions are absolutely controlled by the First Amendment. Even worse, Chief Walter warned Miller that he could be facing "charges of disorderly conduct" for putting up any similar posters. Fascism can cause blunt head trauma and/or violent death. 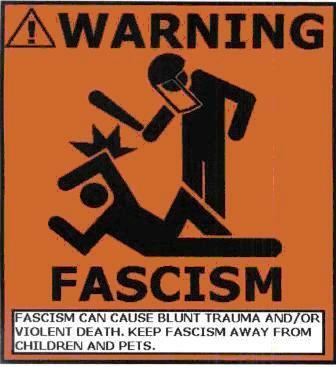 Keep fascism away from children and pets. The posting depicts violence and mentions violence and death. The campuses threat assessment team met yesterday and conferred with UW System Office of General Counsel and made the decision that this posting should be removed. It is believed that this posting also has a reasonable expectation that it will cause a material and/or substantial disruption of school activities and/or be constituted as a threat. That the First Amendment's protections fully extend to public universities like UWS is settled law. See Healy v. James, 408 U.S. 169, 180 (1972) (citation omitted) ("[T]he precedents of this Court leave no room for the view that, because of the acknowledged need for order, First Amendment protections should apply with less force on college campuses than in the community at large. Quite to the contrary, �the vigilant protection of constitutional freedoms is nowhere more vital than in the community of American schools'"). The First Amendment's guarantee of freedom of expression does not exist to protect only non-controversial speech; indeed, it exists precisely to protect speech that some members of a community may find controversial or offensive. The right to free speech includes the right to express things that are deeply offensive to many people, and the Supreme Court has explicitly held, in rulings spanning decades, that speech cannot be restricted simply because it offends others. In Papish v. Board of Curators of the University of Missouri, 410 U.S. 667, 670 (1973), the Court held that "the mere dissemination of ideas�no matter how offensive to good taste�on a state university campus may not be shut off in the name alone of 'conventions of decency.'" In Terminiello v. Chicago, 337 U.S. 1, 4 (1949), the Court held that "a function of free speech under our system of government is to invite dispute. It may indeed best serve its high purpose when it induces a condition of unrest, creates dissatisfaction with conditions as they are, or even stirs people to anger." In Texas v. Johnson, 491 U.S. 397, 414 (1989), the Court explained the rationale behind these decisions, noting that "[i]f there is a bedrock principle underlying the First Amendment, it is that the government may not prohibit the expression of an idea simply because society finds the idea itself offensive or disagreeable." Under these standards, there can be no question that Miller's postings are protected. The essentiality of freedom in the community of American universities is almost self-evident. No one should underestimate the vital role in a democracy that is played by those who guide and train our youth. To impose any strait jacket upon the intellectual leaders in our colleges and universities would imperil the future of our Nation. ... Teachers and students must always remain free to inquire, to study and to evaluate, to gain new maturity and understanding; otherwise our civilization will stagnate and die. Furthermore, the investigation of protected speech, once it is determined to be protected, is a violation of the rights of the person being investigated. Sweezy v. New Hampshire, 354 U.S. 234, 245, 248 (1957). UWS had no permissible reason to remove the postings and has no permissible reason to pursue criminal charges or even a disciplinary meeting with Miller. UWS must immediately end all investigation of Miller's protected speech. In response to this, the University did cancel its meeting with Miller about this "incident," but Sorenson and others in the school's administration sent an email to all faculty and staff, insisting that the school was in the right in removing the posters, claiming that "the posters in question constituted an implied threat of violence." This despite all of the clear evidence that the posters made no such threat at all. Once again, we're reminded that free speech isn't always so free, and must be watched after vigilantly.